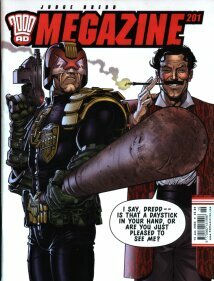 The Judge Dredd Megazine Odyssey: So What's This Blog About? 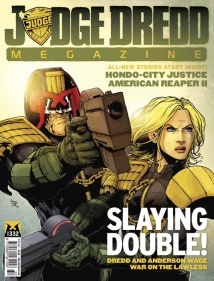 What is the Judge Dredd Megazine, or Meg? The Meg is published by Rebellion who publish the British anthology weekly comic 2000 AD (often referred to as Progs), which has been in existence since 1977. The Meg is a monthly magazine which runs comic strips centred around the Judge Dredd universe and explores, not only old Stoney Face himself, but other characters, other countries and even other galaxies in this future world. The comic strips aren't only about the Judge Dredd Universe, other storylines appear based around the science fiction and horror comic genres that 2000 AD is rightly famous for. Many of the regular writers and artists from the weekly, write and draw for the monthly too. In addition, the Meg includes text (or prose) stories, interviews with creators and articles about other comics, movies or TV shows that would interest the readership. Each edition also includes reprints from the extensive 2000 AD archive that were originally featured in either the Prog or Meg of yesteryear. So why Megs - why not Progs? Well, I prefer the Megs in many ways. I like the fact they centre around the Judge Dredd universe and explore the different facets to that world. I like the longer story format - with often 10 pages of each story in each Meg and those stories can span many Megs. I like the text articles - I'm interested in artists and writers and so on. I've heard the Meg is a bit edgier - experiments are tried - I like that. And I like the reprints - and if I got them bundled with the Megs I bought / were given then I will review them too. Good question! I recently returned to reading the Prog after a 30-odd year absence. I originally read them when I was at school, along with Battle Action Force and pretty much any other comic I could lay my hands on. I then got into Sci-Fi books, like Douglas Adams and Issac Asimov, and so left the world of comics behind. I still liked the read comic strips like Garfield, Calvin and Hobbes and The Far Side and bought the odd graphic novel by Alan Moore (V for Vendetta, Watchmen), but it wasn't until seeing the new Dredd movie in 2012 I decided to check out 2000 AD again. And why are you doing this? The Megs are sometimes seen as the poorer cousin of the Prog, and I want to highlight just how good the Meg actually is. Of course, you can hunt around on eBay or the classifieds trying to seek out all the back issues as I have done - or you could go to the 2000 AD shop online, or a quality newsagent, or the iPad app - and pick up the latest paper or digital edition and try it for yourself. I like the sound of this, where can I find out more? Apart from following my adventures in this blog, you can check out the creators' blogs and other 2000 AD fan sites that I will link to. But a darn fine place to start is the 2000 AD Forum. It really is one of the most friendliest forums on the Internet, where people who've read from Prog 1 to people who picked up their first copy yesterday mingle, chat and debate topics - both about the 2000 AD world - and about life in general! The site is run by Rebellion, who generously devote staff and server time to keeping it going, and by the volunteer moderators who make sure everything runs smoothly. My forum ID is SimeonB, and I have a thread on the forum where I am posting my adventures as well as this blog. You'll be able to see comments and questions I have answered over there too. You don't need to register to read the threads, just to post. Another great place is the BARNEY site, run by Wakefield Carter. This site is an encyclopaedia of everything to do with 2000 AD, and publishes lists of stories and creators that appeared in all the associated publications since 1977. Also, if you like original comic art, there are galleries of them on this site and Wake sells too. Each review will include a link to the Meg's entry on BARNEY, so if I haven't mentioned an artist or writer or an article you swore was in there, please follow the link to the site. I've said it before, but I'll say it again - BARNEY rocks! I'll also include a link in each review to BARNEY's record of the cover. Anyway - feel free to join in the debate - or read along the same issues with me. I won't reveal twists, or whodunnit - just an intro into what the stories are about so you can decide if it's worth the effort tracking down the Megs or digging them out the loft if you own them already.